Natural stone surfaces are a big investment. Whether you’ve recently outfitted your kitchen with gorgeous marble countertops or you’ve recently purchased a home with travertine floors, it’s important to protect your investment. Repairing natural stone surfaces can be expensive, so you should always make an effort to practice good preventative care. 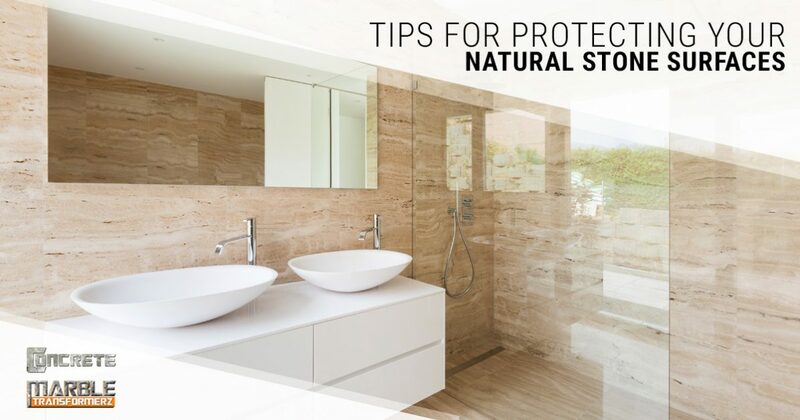 In today’s blog post, we’ll give you several tips that can protect and prolong the life of the natural stone surfaces in your home. Concrete & Marble Transformerz is proud to be Los Angeles’ Top Rated Local® restoration company. We serve Long Beach, Redondo Beach, and the greater Los Angeles area. We’d love to help you with stone restoration in your home or business—contact a friendly member of our staff today to schedule a free, no-obligation assessment! 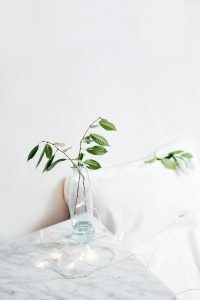 If your home is furnished with marble, granite, or travertine floors, one of the best ways that you can keep the surface in great condition is by placing rugs and mats in the high-traffic areas of your home. Try finding a few rugs that fit the aesthetic qualities of the rest of your home and place them in the kitchen, entryway, and hallways. Rugs and mats will significantly cut down on the amount of dirt and sand that guests bring into your home. Before placing rugs and mats in your home, be sure that you’ve thoroughly cleaned your floors. Leftover dirt and sand beneath a rug is recipe for disaster—the last thing you want is to discover is that your rugs and mats have actually done more harm than good! Whether you’re cleaning your granite countertops or scrubbing your shower, never mix bleach and ammonia together. Bleach is not only corrosive to some natural stone surfaces, but this combination creates a toxic gas that can be lethal when inhaled. A good rule of thumb is to never mix chemicals together, no matter what your intended use is. Always use chemical cleaning products as directed by the instructions, and be sure to check that the chemicals you use on your stone surfaces won’t have any unintended effects such as staining or creating a cloudy appearance. Many California residents have natural stone showers that require special care and maintenance. One of the most common problems with natural stone showers is that soap residue builds up easily, creating a cloudy and unsightly film. One way that you can minimize the amount of soap buildup after each use is to purchase a small squeegee that you can use to wipe down your shower after each use. While this will require a few extra minutes each day, it will significantly reduce the amount of time it takes you to fully clean your shower. If you decide to use a cleaning product to remove the soapy film from your shower, make sure that it is intended to be used on whatever natural stone your shower is made of. As we mentioned above, using the wrong cleaning solution on a natural stone surface can lead to permanent damage. If you’re not sure about which product you should be using to clean your shower, just call Concrete & Marble Transformerz! We can help you develop an individualized care plan for the natural stone surfaces in your home, and we can also help you with stone restoration if some areas in your home could use polishing and refurbishment. We hope that these tips will help you protect the natural stone surfaces in your home from damage and degradation. If you have additional questions about stone cleaning and restoration, we’re happy to help! Call us at 562-206-2729 or get in touch with our restoration company using our online contact form!